Join one of the 5,000+ local groups to stay motivated and connect with people just like you. Watch the videos in the comfort of your home and on your own schedule. Join discussions in our online community. You'll have access to both! You can continue searching in a nearby area to expand your results. Class is 100% worth taking! I just finished my first FPU class. I loved everything about it! I recently graduated college and am starting to make money regularly. I never knew much about how to budget or how to manage my finances. Now I feel much confident in my money choices, can start my future out right, and be accountable for my money. I have baby step one finished and Im attacking baby step two right now!! I would recommend this class to everyone! course is very simple to follow. Great to do with friends! We really enjoyed the class. Great practical information. The only thing we would suggest would be more time having discussions with group members about that weeks topic. We felt like we were just showing up to class to watch a video, which we could do at home. Would like more group work/discussion. So glad you asked. For starters, you’ll get access to FinancialPeace.com. That’s where you’ll find all nine video lessons taught by Dave Ramsey, Rachel Cruze and Chris Hogan. We’ll also help you find a local group if you want to attend in person. Your membership includes: •	A workbook that goes along with the lessons. •	The opportunity to ask questions to our trained financial coaches. •	Legacy Journey, Dave’s six-lesson course on building wealth. •	Smart Money Smart Kids, Rachel and Dave’s course on teaching your kids about money. •	An online community made up of like-minded folks who are working to get out of debt, save and invest for the future. •	Exclusive Ramsey event livestreaming. •	Access to EveryDollar Plus, the budgeting tool we created with you in mind. •	Plus, other amazing tools for tracking your progress. How long does a membership last? Your membership is an annual membership that renews every year. You can cancel at any time. Does my membership cover my spouse? Yes! Only one membership is needed per household. What if my membership expired? No worries! 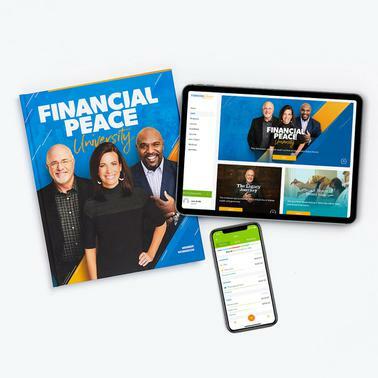 When you log into your financialpeace.com account, you'll be prompted to renew your membership at a discounted price. How do I find groups in my area? Click the "See available groups in your area" link above to search by address, city, state or ZIP code. How often does a group meet? For how long? Groups meet once a week for nine weeks to watch and discuss each video lesson together. Each week, groups typically meet for about 90 minutes. What if I miss one week of my group? No biggie! You can watch the lesson you missed from your online account. However, you must attend eight of the nine weeks to qualify for a graduation certificate. What if there isn't a group in my area or one that fits my schedule? Don't let that keep you from changing your life! Purchase your membership now and start working through the lessons at your own pace. You can join an in-person group at any time if one becomes available for you. Is there childcare available for groups? Some groups offer childcare, and others do not. After you activate your membership, you'll be able to view the details of each group before registering for that group. No problem! You can cancel or change your subscription online or over the phone (whichever you prefer) at anytime! We don't think you're going to want to give up these powerful tools and lessons, but we make the cancellation process simple and hassle-free. How long does a gift membership last? A gift membership lasts 12 months. The recipient will have the option of renewing the subscription at the end of the 12-month period. Can I send Financial Peace University to someone who does not live in the United States? Not yet, but we're working on a solution for you! Can I get Financial Peace University in another language? We only offer Financial Peace University in English at this time. How will my gift recipient register for a group? Your gift recipient will receive with a workbook that contains an access code to financialpeace.com. Once your recipient has activated his/her account, he/she will be able to register for a group. What if there isn't a group in the area of my gift recipient? Don't let that keep you from changing his/her life! Purchase the membership now and the recipient can start working through the lessons and activities at his/her own pace. Your gift recipient can join an in-person group at any time if one becomes available. All physical products will be processed and ready to ship within 2 business days (often even faster). The total delivery time depends on the service you chose and where your order is being delivered. You may see multiple shipping options to choose from during checkout. Our default choice will always be the most economical, but not necessarily the fastest.